...VERY fun break, VERY disappointing cards. The designs are great, especially the puck-autos, but for player distribution and $$-value the box isn't worth $254...not even close. 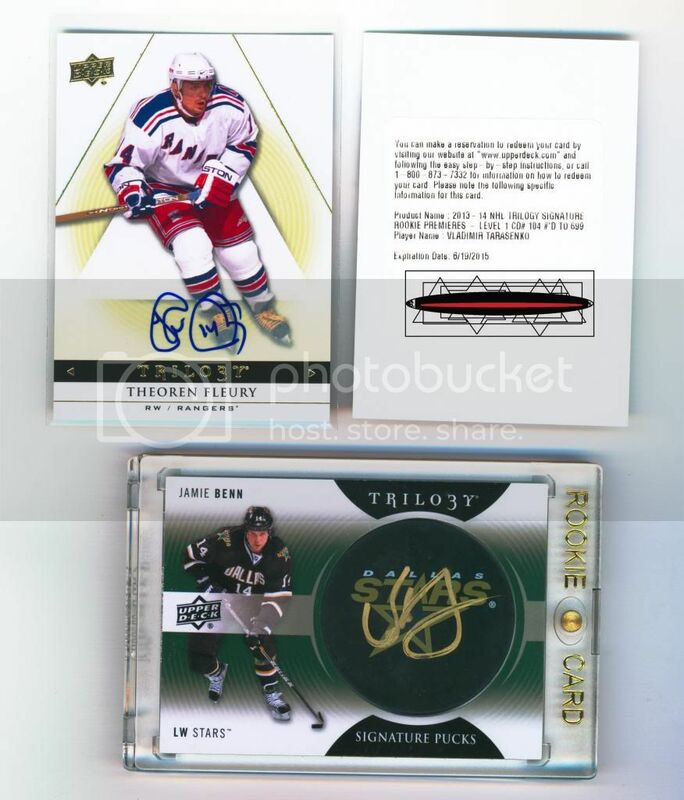 I don't like the Theo Fleury card of him in the NYR outfit...just seems out-of-place. Let me know what you think, I love the designs, but I feel like I got the shaft. All will be for trade. The redemption is being redeemed, though. 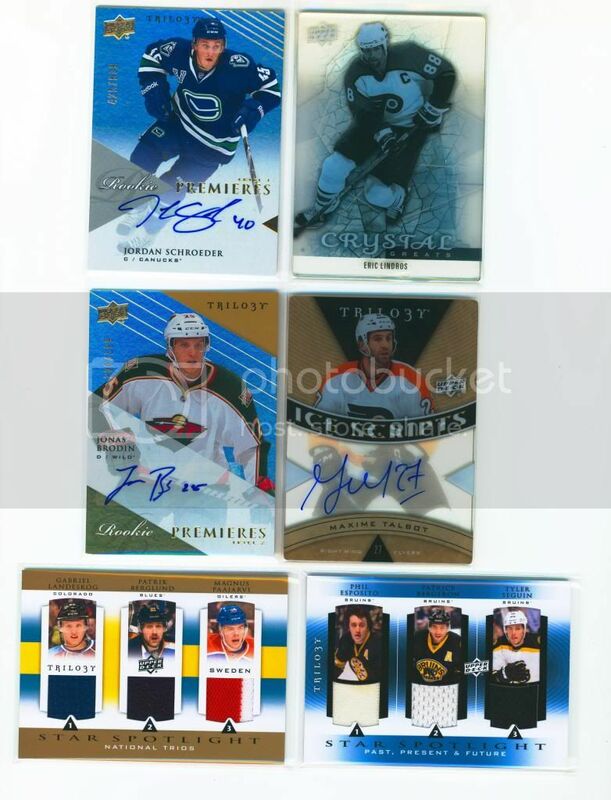 Some ok hits, Tarasenko RC is the best hit. An ok box, but it could be better. That puck card will be probably net you $10-15 if you sell it right now since it's so new. The Fluery will probably get a little more because I think they're tougher hits. No idea who that dude is they gave you as a redemption, but he'll probably be retired by the time you get his card. The Lindros is cool looking, but again, not much value. I would say you PROBABLY could have picked up all those cards for less than $100. However, no chase = no HUGE MOJO and that's the fun part of the hobby. At this price point, I'm staying away. If they were about $100 cheaper, I'd be all over them. That being said, if you're interested in moving the Lindros, check my org. Maybe we can work something out. I agree. Cards do look great. Too bad you didn't get the big hits but I think you did OK.
Are you looking to trade the Lindros Crystal? (07-22-2013 03:20 PM)SGC300ier Wrote: [ -> ] No idea who that dude is they gave you as a redemption, but he'll probably be retired by the time you get his card. Everybody is pulling the Tarasenko redemption it seems like. Way overpriced in my mind also.--- $29 a pack for what you get. And even if you get a Yakupov Level 1 or 2 you will only get at most half of the value of the box back. wish they had kept the price at $20 like UD Trilogy was before. (07-22-2013 10:12 PM)hckydv7 Wrote: [ -> ] Way overpriced in my mind also.--- $29 a pack for what you get. Interested in the Schroeder, if you want to check my org.